You know that warm fuzzy feeling when someone says a kind word about the events you work tirelessly to organize and promote? It’s nice to know that someone noticed, right? That kind of feedback isn’t just good for your soul, it’s also good for business. Especially when your fans are willing to tell others. Now, don't you wish you could bottle up that kind of goodwill and use it to grow attendance and offer more value to your partners? This article will show you that you can. Keep reading to learn how. Word-of-mouth is the best way for new people to learn about your events and associations because it comes with the built-in authoritativeness you get from a third party recommendation. But good word-of-mouth buzz tends to be sporadic and almost impossible to solicit organically. Let's learn about partner invite programs for events, a low-key and effective marketing channel you should have in your toolkit. 92% of consumers believe suggestions from friends and family more than advertising. 88% of people trust reviews as much as they trust recommendations from personal contacts. 74% of consumers consider word of mouth a key influence on their purchasing decisions. The good thing is, you already earn that trust by putting on events that deliver the kind of value and knowledge your audience expects. But you want and need to grow to meet goals. The difficult part is earning the trust—and business—of those unfamiliar with your events and services. If you could establish a predictable and repeatable way of earning word of mouth marketing, that would be valuable, wouldn't it? That’s what an invites program does. And if you're not using one, you’re leaving money (and really good marketing) on the table. You provide your partners with promotional collateral, along with a compelling incentive for them to share it to their networks, and they distribute it digitally, "inviting" their audience to your event. The collateral (such as social sharing images, landing pages, banners, email templates, and more) boasts of the partnership between your event and your partners' brands, and includes a portal through which your partners' prospects can learn more and register. 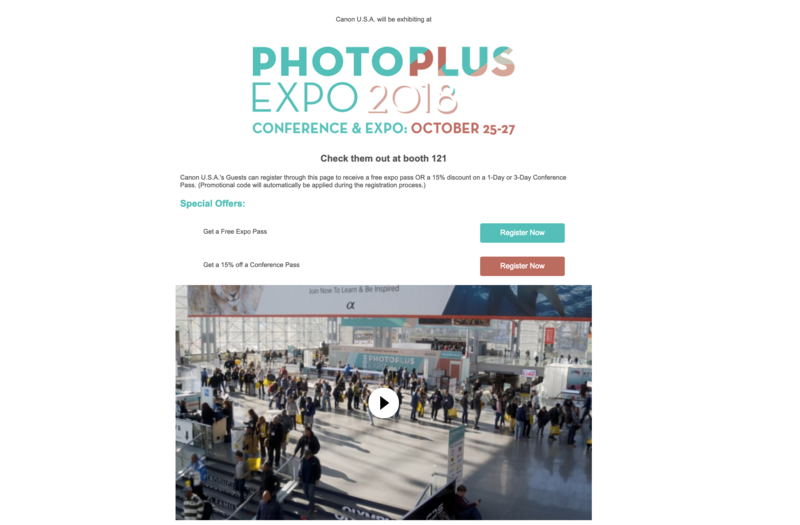 An example partner landing page for Photo Plus Expo 2018, distributed to Canon USA's audience. This page was part of an invites campaign that added 420 additional registrations to the event. Consider this: they are already partnered with your event. They understand your value. That part of the sales process (the hard part) is already done. What partners want next is to get the most value out of their partnership with you as they can. By offering tangible incentives in exchange for participating, such as extra tickets or an upgraded exhibitor package. Read more on partner incentives here. By boosting the number of their own prospects in attendance, thereby raising their profile at the event and increasing their sales opportunities. There are a lot of other mutual benefits to a partner invites program. Learn all about them in our ebook, The Modern Marketing Toolkit for Events & Associations. All you really need to do is make it easy for them to shout from the rooftops "I love this event! Won't you join me there?" Now that you understand the what, why, and who of partner invites, next is the how. Marketing tools like nvytes, Gleanin, and Feathr's own Invites product offer simple design interfaces and templates to design invite collateral for hundreds of partners in minutes, using merge variables (using merge variables, you enter the partners' name, booth number, logo, etc. and the invites program automatically applies it to every piece of invites collateral). You don't have to know anything about design or web development. The tools are plug-and-play. And invites programs augment other forms of digital marketing, too. Once your collateral is ready, the tools provide a way to easily distribute it to partners. For example, Feathr's Invites gives them access to their own partner dashboard, where they can download, copy, and track their Invites collateral. An invites program fosters relationships with partners, adds mutually beneficial value to exhibitor, sponsor, and speaker deals, and grows your attendance and digital audience. It's a marketing tool you should use in 2019 and beyond. Contact us to learn how to start today.